We’ve been back in Michigan a little over two months now and we’re getting settled more and more. Some things are easy to get used to (doctors speaking fluent English! more affordable food! ), and other things a little harder (no trains! where are the vending machines and convenient stores? where is the RAMEN!?). It’s been super fun introducing Lillian to family and friends, and in between time spent taking care of her I’ve been able to start making my own bread again (this book is great if you want to start making your own, too! ), prepare freezer meals for those really busy days (the BBQ Beef & Carrots and the Honey Dijon Chicken & Potatoes from this set of meals were fabulous so far! 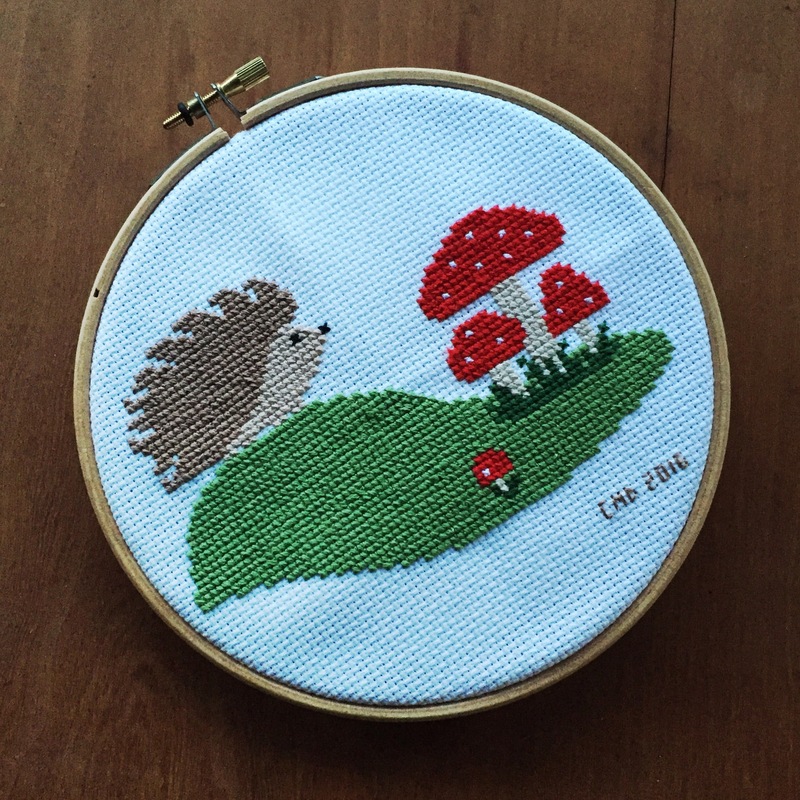 ), and work on some crafty projects here and there–like this hedgehog cross stitch I started when I was pregnant last fall! I never thought I had the patience for cross stitch, but I decided to give it a try again after making these little matryoshka. I usually worked on the hedgehog and mushroom project while listening to a podcast when Lillian was napping (my current favorites are Invisibilia and Gastropod, you? ), or while rocking her to sleep. If I was rocking her I often just had classical nap time music playing, and found I’d get lost in The Flow of sewing–very meditative! I guess I found a patience I didn’t know I had! This cross stitch was a kit I purchased from sewingseed, and I was really happy with it. All of the thread was pre-cut and organized, and there were clear instructions for a beginner. Sometimes I got sick of having to re-thread my needle so frequently, but at least I didn’t end up waving anyone up for dinner**. Fortunately, I remembered my mom always used magnets and a magnetic board to help keep her place when doing cross stitch and was able to purchase a cheap set. I think I would have experienced a lot more frustration trying to keep my place with the pattern had I not gotten place-keepers! I definitely appreciate all of the lovely cross stitching my mother has done even more after making one myself. I’ve got one more cross stitch project to go, and after that I’m not sure if I’ll continue with cross stitching or not. Somehow it feels like I should be making my own design rather than doing someone else’s, sort of like when doing adult coloring. I enjoy both, but I feel like I want to take things a step farther and create more from my own imagination! What do you think? **Once in a crafting meetup in Tokyo our lovely Russian teacher told us a short sewing-related folktale: In old times, people felt they should give soldiers passing by a meal. One day a woman was sewing with such long thread that she was waving her arm in and out of the window and a soldier–thinking it was an invitation for a meal–came up to ask what was for dinner! You can read another little tale she told us here. Aw, thank you! I hope that if you try cross stitching that you enjoy it!